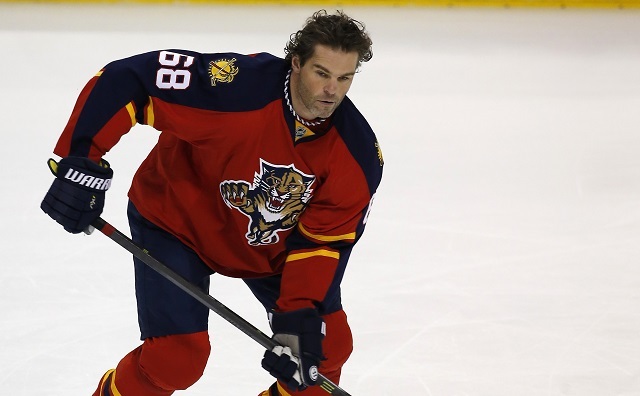 Jaromir Jagr is like a fine wine; he just seems to get better with age. In the age of trap defenses, controversial goalie equipment, and elite goalie tenders, the 44 year old winger is having a very successful season. In his 25th NHL season (you read that right) Jagr has tallied 23 goals and 31 assists in 67 games, good enough to pass legend Gordie Howe to stand alone as #3 all-time in career points. What makes this even more crazy is that he stands at #3 considering he left the NHL from 2008-09 until his return with the Flyers in 2011-12 when he went to play in the KHL. Jagr, a future first ballot hall of famer, has had quite the career, winning 5 Art Ross trophies (scoring leader), one Hart trophy (League MVP), and 3 time winner of the now defunct Lester B. Pearson trophy (MVP by NHLPA). Oh, and don’t forget to throw in his 13 all-star appearances, 2 Stanley Cups, and his 20 NHL records. How does he do it? How can he play in a game that is predominately players in their 20s? How does he get out of bed in the morning when other 44-year-olds around the country are grabbing their backs and sides after doing yard work the day before? The answer is his work ethic. Jagr has been known to be the first player on the ice and the last one off, often getting spare keys to the facilities so he can train on his own time. He starts his day by getting in his pool, about knee high, then doing 1,000 jumps out the water per leg…. Wow. An example of his work ethic showing was after his team’s shootout win game Saturday, March 12th against the Flyers (a game he had 2 assists in). Jagr was spotted on Instagram around 1:30 am lifting with not one, but two weighted vests on. In his broken English he wrote that he still had energy so he decided to go to the gym. That’s dedication. After games, especially games that go the distance, overtime, and a shootout most players are found taking ice baths and getting ready to go home… Not Jagr. When most 44 year olds complain about pains in their bodies or the demands of their job, Jagr is out there training. Good for him. After all he’s 29th in scoring… At 44 years of age…With no signs of slowing down. And with Florida sitting at the top of the Atlantic Division, the ‘Ageless Wonder’ will get the chance to show his remaining skill in the playoffs as he skates against the best youth in the NHL. For any one else that sounds like a tall order, but for the always energetic Jagr, with a chance to lift the Cup for a 3rd time, I’d bet he shows up in a big way.